This post is about integration of spring boot mvc with jsp.Here, we will be developing a spring MVC boot app in integration with jsp using spring controller.We will be using tomcat-embed-jasper artifact to render jsp.So let us start by defining our maven dependencies first. tomcat-embed-jasper: This is the artifact which is actually required to render .jsp pages in spring boot app. EnableAutoConfiguration This will help apring boot to automatically identify how to configure Spring, based on the jar dependencies that we have added. Since spring-boot-starter-web added Tomcat and Spring MVC, the auto-configuration will assume that we are developing a web application and setup Spring accordingly. We have implemented WebApplicationInitializer.java to configure the ServletContext programmatically. Defining this bean configuration is the main important part which will register the view resolver and also define the JstlView class. 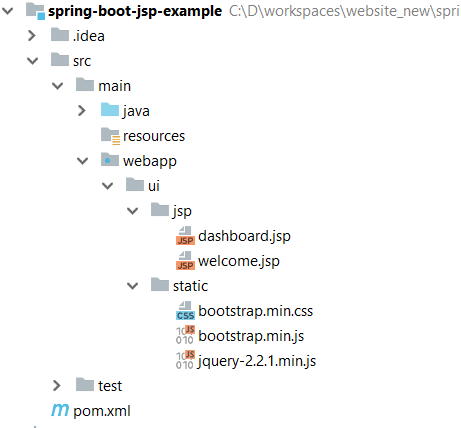 By default Spring Boot will serve static content from a directory called /static (or /public or /resources or /META-INF/resources) in the classpath or from the root of the ServletContext. But here we have defined out custom folder structure for static contents, hence it is required to tell Spring boot about how to render static content. Now let us define our controller that will serve the response to the client. Here we have hardcoded some user details. 1.Run Application.java as a java application. 2. Hit the url as http://localhost:8080/welcome.Following welcome.jsp page will be displayed.